A contemporary fusion of country and pop playing styles for piano. Already back in the 1970s, artists started deviating from the traditional country mold by incorporating obvious elements of pop music, both in terms of songwriting, instrumentation and production. It proved hugely successful in reaching new audiences outside the core demographic. Still to this day, chart-topping stars like Taylor Swift, Keith Urban, Lady Antebellum and many others keep pushing the boundaries of what country is and can be. This collection of EZkeys MIDI comes with a broad selection of playing styles inspired by contemporary country pop where the piano plays a leading role. Expect timeless country elements fused with catchy pop phrasing, epic hooks and big melodies. 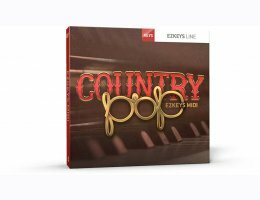 This is the perfect collection of EZkeys MIDI for writers of modern rock or pop looking to infuse some commercial country flair in their next batch of songs. Start writing!